It needs a specific HTML structure. You can find download links for the JS & CSS files here. You could include them direct but I like to download them & add them locally, putting them into the qunitsrc directory. Why’s that? 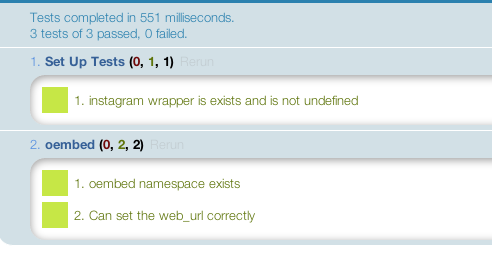 Well, turns out in the equal() call I referenced sayHi, but it’s actually saysHi. Run it again, and it passes! Obviously this is more a personal preference, so if you want to do it, feel free, but if not, that’s fine too. Now I want to write some code to get the media URL that is returned from this API end point: http://api.instagram.com/oembed?url=http://instagr.am/p/BUG/. I could write the Ajax call in a get_url() function but as this query returns a set of data, I’ll write a function to take a callback that has the data passed into it, and let the user then grab what they need. I’ll also be using jQuery here for the Ajax calls. We could do them in cross browser JS, but that’s a huge pain & beyond the scope of this tutorial. Normally at this stage I’d say to write the test, but we have a problem. How do we test asynchronously? The obvious answer is to make the Ajax test non-async, but that’s not a good solution. Thankfully, QUnit helps us out here with its asyncTest() method. 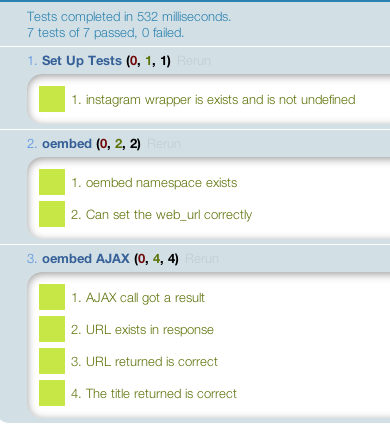 And inside the callback, before you call start(), is where you run your assertions that rely on the Ajax result. I’ve written some tests within the callback that should validate everything works correctly. I then call start() to tell QUnit it can run the rest of its tests again. Expected at least one assertion, but none were run - call expect(0) to accept zero assertions. The code works by taking a callback, that it will automatically pass our data into. Run the tests, and I’m greeted with all greens, lovely! That brings us to the end of the first tutorial. In this we’ve achieved a great deal, learning how QUnit works, how to run async tests in QUnit and working with the Instagram API too. Not bad at all! Next time we will continue writing & testing, but at a bit more of a faster pace, now you’ve got the hang of QUnit. You can get all the code from the Github Repo. Each tutorial is on its own branch, for this one you want the branch tutorial1. The master branch will contain the current up to date code, whereas the tutorial branches will only contain the code from each tutorial and no more. Any questions, please leave a comment and I will answer them in part 2.